With its large and strong cargo deck, the new Toyota Hilux easily handles bulky or heavy loads. 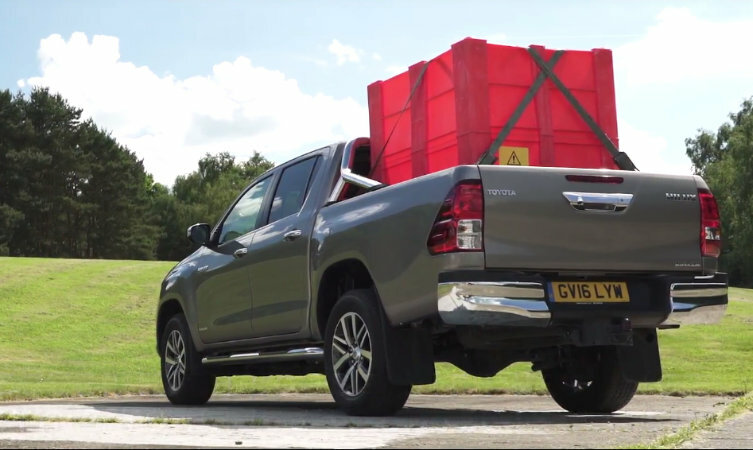 Hilux can carry up to 1 tonne of cargo, so it’s important to safely load the cargo deck to keep you, your load and other road users safe. To help you load the cargo deck correctly and safely, please watch our latest film or read on below for more details. Begin loading by evenly distributing the weight to keep it close to the centre of the vehicle. Load up to the bulkhead to prevent cargo from sliding forward under heavy braking. Secure loads with straps that are anchored to Hilux’s tie-down hooks. Cover taller or bulkier loads with sheeting or netting attached to the tie-down hooks to prevent objects coming loose and falling out of the vehicle. Before you set off, double-check that all straps are anchored correctly and fastened tightly, and then repeat these checks at regular intervals to ensure that nothing has come loose in transit. To download an owner’s manual for your Toyota vehicle and to access other owner benefits, please visit My Toyota.